Most of us have been there. It's late, your tired, and maybe, just maybe, you've had one or two too many. You go to your computer and a brainwave sweeps over you. Now would be the perfect time to email your ex, or that person you like, or that co-worker you completely dislike. 30 seconds later and email is off into the ether, like an unstoppable forcce of nature. Oh course it wasn't a good idea. In fact, it could very easily be one on the worst ideas you ever have. Thankfully the good people at Google have recognised the problem and are lending a heand to stamp out this late night tomfoolery. The latest addition to their already impressive arsenal is Mail Goggles. 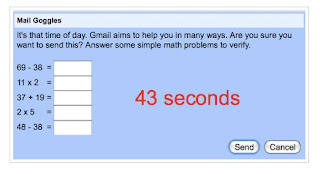 In a nutshell, you set the time that you want it to come on at and if during that time you try to send an email, you will first have to solve a series of crafty math problems.